--The fearless activist, author and champion of big-city life. -- Love and language, happiness and sorrow, on the Great Blasket Island. -- A much-loved natural material and its man-made imitators. -- A rags to intellectual riches story of genius incarnate. I write books, sometimes on quirky topics, like leather and its inspired imitators; that was the subject of my book FAUX REAL. My 2012 book, ON AN IRISH ISLAND, took me to a windswept island village off the coast of Ireland, the setting for a story of love and friendship, literature and language, in the early years of the twentieth century. It came out in a Vintage paperback edition in February 2013, this time with a subtitle: The Lost World of the Great Blasket. I've also written books about the French Riviera; Frederick Winslow Taylor, the first efficiency expert; mentor relationships among elite scientists; and about the Indian mathematician Ramanujan; that book, THE MAN WHO KNEW INFINITY, has been translated into a dozen languages and was made into a 2015 film starring Dev Patel and Jeremy Irons. Before I started writing books in the 1980s, I wrote magazine articles, essays, and reviews, hundreds of them. But once I started with books I couldn't get enough of them -- big, meaty projects that take me into new intellectual, geographic, and human worlds and demand my best energies for the four or five years it takes to research and write them. After twelve years as a professor at MIT, I returned in 2011 to Baltimore where I've spent most of my adult life and where I'm back to writing full-time. My latest book, published by Knopf in September 2016, is a biography of Jane Jacobs, the fearless activist, author and champion of big-city life. 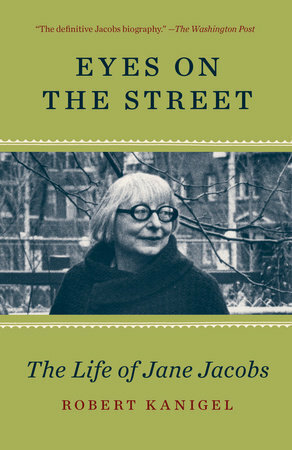 It's entitled EYES ON THE STREET: The Life of Jane Jacobs. I am currently working on a biography of a classics scholar who in the 1920s overturned long-prevailing ideas about the origins of the Odyssey and the Iliad. Its provisional title is Hearing Homer's Song: The Brief, Obsessed Life of Milman Parry. The National Endowment for the Humanities has awarded me a 2018 "Public Scholar" grant to help me in the research and writing of my biography of Milman Parry. Parry was the American classical scholar who in the 1920s revolutionized our understanding of how the great epics, the Iliad and the Odyssey, came to be. The Man Who Knew Infinity is to be published in a Turkish translation by Eclipse, Istanbul. Maureen Corrigan, of NPR's Fresh Air, has included Eyes on the Street as one of her "Ten Best Books of 2016." Booklist's "Top 10 Arts Books"
Eartheasy's "8 Books for a Sustainable Mind"
World Architecture's "Top 10 Architecture Books of 2016"
The Australian's "Books of the Year"
Passerbuy's "Best Books of 2016"
Times Higher Education's "Books of the Year 2016"
Englewood Review of Books's "Best Books of 2016"
America Magazine's "Ten Best Reviewed Books of 2016"
Russian and Chinese translations of Eyes on the Street are in the works. National Public Radio has named Eyes on the Street to its Best of 2016 list in the areas of biography, history, and women's interest. "[Jane Jacobs] was great, and Kanigel gives her the great biography she deserves," writes Edward Glaeser in American Scholar of Eyes on the Street. Publishers Weekly, Kirkus, and Booklist have each given it "starred" reviews. Knopf published the book on September 20, 2016. Eyes on the Street has been "longlisted" for the 2017 Andrew Carnegie Medal for Excellence in Nonfiction. The film, The Man Who Knew Infinity, was released in the United States on April 29, 2016. The film had its world premiere at the Toronto International Film Festival on September 17, 2015. Dev Patel plays Ramanujan. Jeremy Irons plays G. H. Hardy. The screenwriter and director is Matt Brown. The film had its European premiere at the 11th Zurich Film Festival and has also been shown at the British, Goa, Singapore and Dubai film festivals. At the Dubai festival, I and Matt Brown held a public conversation on the adaptation of the book into a film. The G. H. Hardy Reader, edited by Donald J. Albers et al and recently published by Cambridge University Press, includes an excerpt from The Man Who Knew Infinity. A Polish translation of The Man Who Knew Infinity has been published by Swiat Ksiazki, Warsaw. The Man Who Knew Infinity has been published in Tamil, Kannada, and Malayalam, languages spoken widely in South India, as well as in these other Indian languages: Bengali, Odia, Marathi, and Gujarai. See Old News and Talks, too.